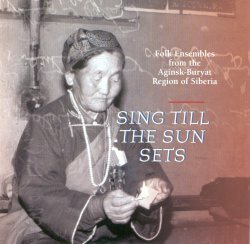 This CD features recordings made in a thinly populated part of East Siberia. We hear about isolation, yet we also discover a link to performances at the Buryat National Theatre in the city of Ulan Ude. The 31 tracks comprise a mixture of songs and dance songs. Most are short, ranging in duration from 34 seconds to just over five minutes. The audio quality reflects the fact that these are field recordings; some have background hiss, others seem to be recorded at a distance, and one or two start and end abruptly. The information given on each track is cursory, although text translations are adequate. The most characteristic of Buryat artistic creation, and represented by a number of tracks here, are dance songs, generally known as joghur (though this is a Western Buryat term). One local musicologist, Dashinima Dugarov, has famously claimed that joghur help the Buryat connect with the cosmos, and certainly they feature at many social events, before hunting, before communal work, and, of course, to welcome visitors. Again, better sleeve notes would have been useful to let listeners know something of the function of the music. For dance songs, you need to imagine an in-out circle dance to appreciate the simple basic structure, the majority cast in duple time and featuring straightforward melodies that never sound particularly strange. Dance songs may alternate a soloist and chorus, or be sung in unison by groups. All repeat short melodic stock phrases rather than being based on extended improvisations. The soundworld is not the familiar Russian, but it always remains consonant and harmonic. The other song genres are mostly sung solo. Some offer advice, social commentary, or funny stories. Occasionally, they suggest Mongolian influence, particularly where horses become the theme. A couple utilise a curious, slightly brash vocal style that seems to come straight from Mongolian 'long songs'. These go some way towards more melodic segments of overtone singing - a form well-known from Tuva and across the border in Mongolia - although, and despite the fact that examples can be found in Buryatia, overtone singing never features on this CD. Some songs are ritualistic, linked to shamanism or, in one case, to Buddhism. Most are unaccompanied - as is normal with Buryat dances - although one song is said to feature the 'violin' (is this not the Mongolian xhoor/khuur?). In reality, this is not music transmitted unadulterated from some distant past. It is part of an old tradition, but one that was both threatened and reformed during Soviet times, and one that today forms part of a national drive to reassert Buryat identity. In 1997, five members of the New York experimental theatre company La MaMa travelled to Ulan Ude (the capital of Buryatia, and the point where the Trans Siberian divides, one branch going southwards to Ulan Baator and the mainline continuing eastwards towards Vladivostock). They were to work with Buryat actors to create a new theatre piece, and with their new colleagues they travelled to an isolated region 500 miles away to collect the oral traditions of the region. This CD is the result of that trip. The recordings are of three folk ensembles based in the regional centre of Aginskoye and the villages of Tokchin and Tsagan-Chelutay. The recording quality is variable, reflecting being in 'the field'. Since the collapse of the Soviet Union, access to the many peoples who inhabit its vast lands has become easier. Tuvan music, famously, has migrated to Western concert halls, particularly the various types of overtone singing. The Buryat, who make up just over 25% of the population of Buryatia to the south, east and north of Lake Baikal, remain little known. Broadly speaking, there are two Buryat groups inhabiting this distant part of the Russian Federation. The Western Buryat, a Turkic people who dominate the Ust-Orda Buryat Autonomous Region north of Irkutsk (and outside Buryatia proper), are linked to the neighbouring Evenk by their common shamanistic beliefs (it is from this region that the word saman [shaman] comes). The Eastern Buryat, a Mongolian people centred on the Aginsk Buryat Autonomous Region, live far to the east of Lake Baikal in an area that borders Mongolia and the wild, virtually uninhabited taiga of Russia's Far East. The Buryat were colonised by Russia from the 17th century onwards, and their lands were populated by Cossacks, Russian peasants, and 'Old Believers' - the fundamental Orthodox Christians expelled from Russia after refusing to accept new ritual practices brought in under Catherine the Great. The latter sought isolation, as did the Cossacks when they faced persecution by the state. The peasants introduced agriculture; the Western Buryat took up pastoralism, but the Eastern Buryat struggled to retain their nomadic hunting and herding. Traders settled in Ulan Ude, and along the Mongolian border in the now-bypassed Kyakhta. Kyakhta was once an incredibly rich staging point in the tea route from China; Ulan Ude became a market for the region's gold, timber, and fur wealth. As elsewhere, people have gradually migrated to the towns. Siding with the White Guards during the Russian revolution did the Buryats few favours - repression followed. The Buryats then gained a degree of separation within an autonomous republic-part of Stalin's policy of encouraging small-group identity to prevent large-scale rebellion - but were forced to adopt Russian language and customs. The last decade has seen much change. The Buryat language is now once again taught in schools, and civil servants must now speak both Buryat and Russian, a regulation that effectively promotes Buryats over Russians. There has been a considerable attempt to revive local culture, and to establish Buryat versions of all performance arts (in addition to the Buryat National Theatre, where performances are given only in Buryat, Ulan Ude has a Buryat Opera House). Note, though, that much encouragement has come from whites; a celebrated example is the folk music ensemble 'Siberian Souvenir', led by the Ukranian Viktor Kitov. Funding for local arts comes from the central government in Ulan Ude, using a model inherited from Soviet times to support cultural centres and resident folk groups. The CD, though, offers much that is unique. The knowledgeable listener will be able to discern similarities to the music of other parts of Siberia, to Russia further west, and to China and Mongolia to the south. At the same time, the CD demonstrates that Buryatia preserves a distinct music culture, a culture that, sadly, is hardly known in the West. In sum, then, the recordings are wonderful, but it's a shame about the sleeve notes.